When you enter the hospital, probably the last thing that you’re thinking about is the floors. However, an emerging body of research suggests that hospital floors are covered with bacteria and could serve as a potential source of infection. Even if people don’t directly touch the floors, other things that patients, visitors, and staff routinely touch are in contact with the floor. Thus, it’s a good idea to minimize your interaction not only with hospital floors, but also things that touch hospital floors (e.g., shoes, socks, and wheelchair wheels) and high-touch surfaces (e.g., call buttons, doorknobs, and bed rails). By minimizing your interaction with these things and cleaning your hands often, you can limit your risk of infection and the risk of spreading infection to others. What Lives on Hospital Floors and Other Surfaces? In a 2014 abstract, Desphande and co-authors briefly detail their efforts to figure out what actually populates the floors of American hospitals. The results of this study are pretty disconcerting because the pathogens found can lead to hospital-acquired infections. MRSA is a staph infection which can cause skin infections, bloodstream infections, and pneumonia and is resistant to many common antibiotics. VRE can cause urinary tract infections and wound infections. It is resistant to vancomycin, a very powerful antibiotic. Clostridium difficile causes stomach pain and severe diarrhea. C. difficile is the most common cause of hospital-acquired diarrhea. It’s really hard to get off floors, with conventional detergents failing to cut it. Instead, research has shown that chlorine-releasing agents are more effective at doing away with this pathogen. Unfortunately, the majority of hospitals don’t use nonsporicidal agents to clean floors, and it’s unclear how many hospitals clean with such effective agents. In their study, Deshpande and co-authors found that C. difficile was not only found in isolation rooms where people with this infection are kept but also in other rooms that don’t house people with this infection. In fact, C. difficile was more often found in non-isolation rooms. Therefore, it seems that C. difficile is adept at spreading. How Do These Pathogens Spread? In a 2016 paper titled “Evaluation of Hospital Floors as a Potential Source of Pathogen Dissemination Using a Nonpathogenic Virus as a Surrogate Marker,” Koganti and colleagues attempted to gauge the extent that pathogens from the floor spread to the hands of patients as well as high-touch surfaces both inside and outside the hospital room. In this study, researchers took bacteriophage M2, a nonpathologic virus, which was engineered not to cause infection, and laid it on wood laminate floors next to hospital beds. They then swabbed various surfaces to figure out where this pathogen spread to. The researchers found that the virus spread to hands, footwear, hands, bed rails, bed linens, tray tables, chairs, pulse oximeters, door knobs, light switches, and sinks as well as adjacent rooms and nursing stations. More specifically, in the nursing station, the pathogen was found on keyboards, computer mice, and telephones. In other words, pathogens on hospital floors definitely get around. Notably, this study did have its limitations. First, a virus was used instead of bacteria. Previous studies, however, have shown that viruses and bacteria transfer similarly from fomites (objects) to fingers. Second, the researchers placed particularly high concentrations of bacteriophage M2 on the hospital floor; thus, this experiment likely reflects a worst-case scenario. Third, the researchers examined only laminate wood flooring and not other types of flooring in the hospital; therefore, it’s unclear how far pathogens could spread from other surfaces like linoleum and carpeting. A final specific concern entailing the transfer of pathogens from floors to fingers and other body parts involves the use of non-slip socks. Non-slip socks are made of either cotton or polyester and lined with treads to provide traction. These socks mitigate fall risk, especially among older people. Non-slip socks are intended to be used for only short periods of time and are single-use medical devices. However, patients in the hospital tend to wear them around the clock and walk around the hospital with them, visiting toilets, coffee shops, gift shops, common areas, and so forth. People often wear the same socks for several days straight and take them to bed, too. In a 2016 short report published in the Journal of Hospital Infection, Mahida and Boswell found VRE on 85 percent of socks and MRSA on nine percent. 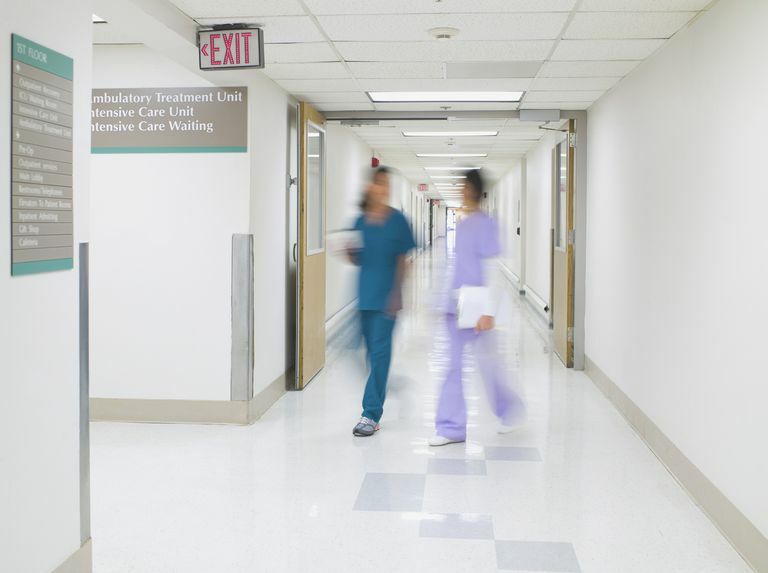 Furthermore, VRE was found on 69 percent of hospital floors tested, and MRSA was found on 17 percent of floors tested. Of note, the power of this study was low and sample sizes were small. The researchers conclude that non-slip socks, which are usually in contact with hospital floors, are a potential nidus of infection. The authors suggest that these socks should be discarded after use and not be worn for extended periods of time. Exactly how long these socks can be donned, however, is unclear, and more research needs to be done. It’s hard to clean hospital floors. It’s also hard to define what “clean” is exactly. With respect to hospital floors, it’s generally accepted that detergents and disinfectants can help control for pathogens. Importantly, detergents and disinfectants aren’t synonymous. Detergents remove dirt, grease, and germs through scrubbing with soap and water solutions; whereas, disinfectants are either chemical or physical interventions that kill bacteria. Several studies suggest that cleaning floors and other surfaces with detergents, and thus merely removing dirt manually, may be just as effective as using disinfectants. Furthermore, expensive, kill-all disinfectants may contribute to the proliferation of resistant organisms. Potent disinfectants could also be harmful to the workers who use them and be bad for the environment. Conventional cleaning methods are pretty inefficient at decontaminating floors and high-touch surfaces in hospital rooms. Current cleaning methods are probably not targeting the right sites or applied frequently enough to reduce the bioburden or the number of microorganisms that could lead to infection. Newer methods, including disinfectants, steam, automated dispersal systems, and antimicrobial surfaces, are hard to evaluate for cost-effectiveness because environmental data are not currently compared with patient outcomes. Moreover, in an era of burgeoning healthcare costs, one ready target of cost-cutting is cleaning, which further contributes to the risk of contamination and potential infection. Removing visual and invisible dirt from the hospitals of today and for the future requires sufficient trained staff, ongoing monitoring, measurement of bioburden, education, constant upgrading of practice, and two-way communication between those responsible for cleaning and those responsible for infection control. For much of the twentieth century, the cleaning of hospital floors and other surfaces that accumulate bioburden was a low priority among hospital administrators. Times have changed and the idea that such surfaces serve as a source of hospital-acquired infection has gained wider acceptance. Nevertheless, we still don’t know how to deal with this problem effectively and lots of loose ends remain. Consequently, whether you’re a patient or visitor, it’s in your best interest to take certain precautions while in the hospital. When you’re either admitted to the hospital or visiting a loved one, it’s a good idea to tread lightly and take precautions that limit the risk of infection. Even if you may not get infected after touching things, you could spread infections to those who could get infected. Specifically, elderly immunocompromised hospitalized patients with various comorbidities are at very high risk for hospitalized-acquired infections. You don’t want to do anything that could make these people even more ill.
Clean your hands with either soap and water or alcohol-based hand cleaners upon entering or exiting a room, after touching a patient and after using the bathroom. Wash your hands thoroughly and do not touch sinks and faucets after washing your hands. Make sure that you dry your hands completely after using soap and water. Do your best to avoid touching call buttons, hospital machinery, bed linens, shoes, socks and any other items that may be contaminated. Don’t touch the floor (sounds silly but it happens—ask any parent). If a loved one is in isolation, wear gowns and gloves when visiting. If you’re a patient in the hospital, you can follow much of this same guidance and do your best to remain pathogen-free. Moreover, remember that it’s absolutely within your rights to minimize your risk of infection, and it’s a good idea to question any risky practices that you may observe among hospital staff. For example, hospital staff should wash their hands or use alcohol-based hand cleaners both before and after touching you, and even if they’re using gloves. Finally, don’t be shy about asking for new non-slip socks whenever you need them. You certainly shouldn’t wear the same socks for extended periods of time or sleep in them. If you do walk around the hospital with these socks, change them upon your return and wash your hands thoroughly. Dancer SJ. Controlling Hospital-Acquired Infection: Focus on the Role of the Environment and New Technologies for Decontamination. Clinical Microbiology Reviews. 2014; 27(4):665-690. Deshpande A et al. Are Hospital Floors an Underappreciated Reservoir for Transmission of Clostridium difficile and Methicillin-Resistant Staphylococcus aureus? (Abstract). 2014. Koganti S et al. Evaluation of Hospital Floors as a Potential Source of Pathogen Dissemination Using a Nonpathogenic Virus as a Surrogate Marker. Infection Control & Hospital Epidemiology. 2016. 37 (11); 1374-1377. Mahida N and Boswell T. Non-slip socks: a potential reservoir for transmitting multidrug-resistant organisms in hospitals? Journal of Hospital Infection. 2016; 94: 273-275. Can You Leave the Hospital Against Medical Advice? Do You Know How to Avoid VRE and Hospital-Acquired Infections? How Clean Is Your Doctor's Stethoscope? Do You Have the Right to Leave the Hospital When You Want To?